For trail hunting enthusiasts, BlazeVideo might ring a bell to you. This manufacturer had dedicated their time in designing and creating trail cameras of the finest quality before releasing it to the market. This manufacturer had been celebrated as a top brand and had been recommended a lot for their excellent quality. The global retail shop was established last 2016. This company will deliver your order directly to your door, allowing you to shop conveniently at the comfort of your own home. Aside from trail cameras, they also offer accessories that will enable you to enjoy optimal convenience and eradicate the hassle while you’re trail hunting. If you are thinking of buying your first trail camera from BlazeVideo, you will find yourself overwhelmed with the hundreds of choices in the market. This list below is the top three best-selling trail cameras from this manufacturer. We’ve narrowed it down the list for you, so you only choose from the best among the rest. High-definition images and video resolution are crucial to studying the animal’s movement and behavior after that. A hunter must equip himself with a game camera that can capture all the necessary details for the analysis later on. This game camera can capture images of up to 16MP resolution and 1080HP videos for precious, detailed recordings of the wild. With the help of this feature, you can study your target animal’s behavior and anticipate their next move, a necessary skill that can contribute to the success of your hunting. Moreover, it is one of the rare models that features a cam + video mode. In this mode, both the camera and the video will function when it detects movement within the perimeter. This trail camera has an SD card slot that can support memory cards for up to 32 GB. In that way, you can leave your camera for days and retrieve only once in every two to three weeks. Another addition to its feature is the 65″ PIR sensor that can detect movements in a broader range. Its night vision, on the other hand, can reach up to 65 feet. Rest assured that any passing animals will be captured with this game camera from a distance. The stealth design and camo housing of this trail camera allow you to install it in the wild without difficulty. You can conceal it with little to no effort as it easily blends with the surroundings. It also helps to lessen the risks of your game camera getting stolen while it’s left unattended in the wild. If you’re studying behaviors of snake or any cold-blooded animals, the time lapse feature of this game camera is extremely useful. Specifying the time interval of recording videos and taking photos of your target animal will allow you to study their behavior in the long run. You can also use this feature as your timer, a great way to experiment with trail hunting. 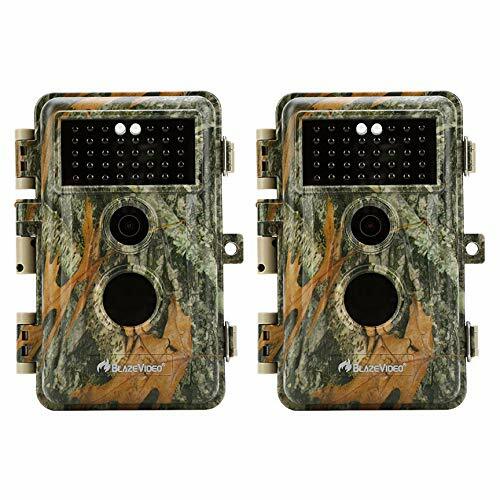 It is not only limited to hunting, but you can also use this game camera for any sports activity, documenting when camping, or can be an excellent alternative for your home security system. For its security, this trail camera allows you to place a password to prevent thief or an intruder from accessing your game camera. It also has the following number function, enabling you to use code locations in the images you’ve captured. This is an excellent feature if you own multiple trail cameras. In that way, you won’t get confused when you’re analyzing data later on. Lastly, this game camera is easy to use. It has a unique button design, a full 2.4-inch LCD screen that allows you to preview your photos on the field, a menu setting that is easy to navigate and trigger time of 0.6 seconds. At an affordable price, you can enjoy these features and capture stunning images of the wild. If you want to study the behavior of your target animal and anticipate their next moves, the images and videos of your trail camera should be able to give you rich details to study later on. This is what this second model from BlazeVideo is all about. This is designed to produce images of 16MP resolution and record 1080P videos once it detects even the slightest motion from a distance. Similar to the first model we’ve reviewed, it also has a cam + video mode. It means that once your trail camera has detected movement or any motion, both the videos and the camera will work together to produce both images and recording clips. Aside from that, it has an SD card slot that can support memory cards with a range of up to 32 GB (SD card not included in the package). It features a 65″ PIR sensor that can detect broader and night vision that can reach up to 65 feet or 20 meters within the perimeter. Thanks to its stealth design and camo housing, installing and securing your trail camera in the forest wouldn’t be a problem. With its camo housing, it can easily blend with the surroundings, lessening the risks of getting stolen from thieves. This is meticulously designed for researchers of the wild animals, giving you rich-detailed images all the while ensuring that it can withstand harsh elements of nature. Another feature that can help with your research on wild animals is the time lapse. Trail hunting requires a lot of patience, and this feature allows you to sit back and relax while your camera does all the work. This is ideal if you are observing reptiles or any cold-blooded animal in the forest. All you need to do is set the interval time of your camera and rest assured that it will take video clips and pictures consistently when the time has come. It also has a long in-filed battery life in a standby mode that can last up to six months with eight AA batteries. This trail camera is energy-efficient and will automatically turn off the device if it detects no keypad controlling in five minutes, allowing you to conserve your batteries in the long run. We understand that even in the forest, thieves are lurking around. Therefore, to secure your trail camera, you may put a password so that no one can easily access your game camera and documentation without your permission. Aside from that, it also has the following number function. Assuming you have placed multiple trail cameras in areas with possibilities of the animals passing or traveling, you can use the serial number to make it easier, later on, to catalog and group the data. Just like the rest of the models from BlazeVideo, this product is easy to use. With its unique button design and integrated 2.4-inch LCD screen, you can adjust the settings while on the field. Even if you are not tech-savvy, rest assured that you’ll be able to get a grip of using this device in little to no time. 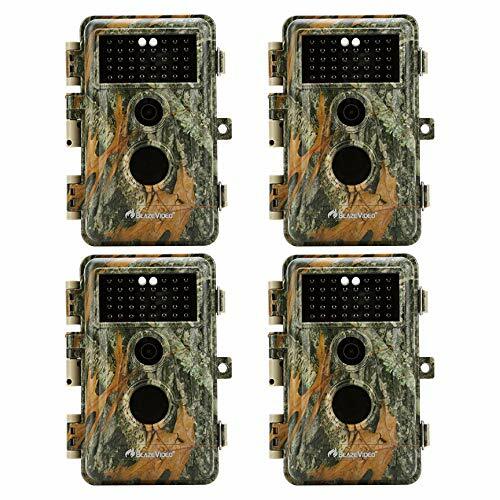 For our last item, we have the BlazeVideo 4-pack game trail deer camera. In trail hunting, the possibilities of the paths that the buck might travel are endless. And if you want to secure your possibilities of capturing the best images of them, you should consider placing multiple cameras in different areas. 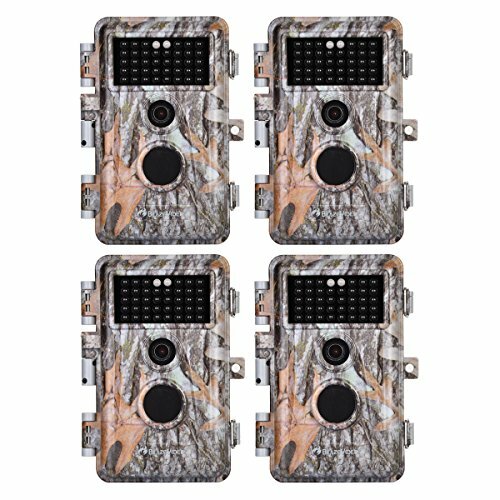 Take a look at this four-pack deer game camera. It provides 16-MP photos and record videos with the quality of up to 1080P. This trail camera also functions as cam + video mode, allowing you to take pictures and record videos once it detects movement. You can insert a memory card with storage of up to 32 GB (not included in the package) to make sure that you don’t run out of storage while your trail camera is in the field. The 65″ PIR sensor can detect motion on a broader range and its night vision can reach up to 65 feet or 20 meters. It has a stealth design and camo housing that makes it easier for you to hide the trail camera in the forest, securing it from thieves. With its efficiency, you can use it as an alternative to your home security system. Also, you don’t need to spend so much time figuring out how the camera works. It is very easy to use, and with the help of the manual, it wouldn’t take long before you can familiarize yourself with the nitty-gritty of this camera. Previous article10 Must Have Features – What Makes a Trail Camera Worth Buying?